Joy. The second fruit of the Spirit. Jesus’ offer and promise to His followers. A command from Paul. Joy, the laughter of the soul that springs from a sublime confidence and trust in God. Yet, how many Christians would describe themselves as joyful? Are you joyful? The honest answer is probably no. Why is that? Why don’t Christians, by and large, appear to be more joyful? I’m not talking about the synthetic enthusiasm that often passes for joy where all things are “awesome” (the single most overused word in the Christian vocabulary today). Where is the joy?!?!? 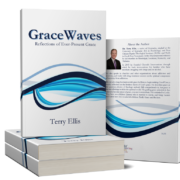 I am sure that the major challenge is a basic misunderstanding of grace. You cannot have joy without grace.. The Greek language of the New Testament helps us understand this special relationship. The words of grace and joy in Greek are both built on the same root – XAP (chi, alpha, rho). The relationship is so very clear, both etymologically and theologically. You can’t get to joy without going through grace. Many Christians strive hard to “make something of themselves.” Through service, spiritual disciplines, study, they do all the right things yet are left with a vague feeling of emptiness, a sense that there should be more. And more of what? They are not quite sure. They only know that they are tired and frustrated. The problem begins with a lack of grace. Marjorie was one of the most joyful Christians I ever met. Unrivaled in service to others and commitment to living the Way of Christ, she shared all the outward qualities that you might see in many Christians in churches every Sunday. Yet she also had joy. She was asked one time how she became such a spiritual giant and prayer warrior. She chuckled at the characterization, and replied, “I tried all that ‘spiritual talk’ one time. It’s just not me.” What she did have was a sublime trust in God that enabled her to relax in the relationship with Him. She trusted Him, simply and winsomely. Having walked with her to the edge of the dark valley, I can attest that she maintained that trust through all her days here. Then grace led her home. Your greatest need is probably to relax in the relationship you have with God through His Son. Trust in His grace. Trust in His love. Trust in His affirmation that you are right now His son or daughter. No, you’re not perfect, but truly your Father is not disappointed in you because He is not surprised! He knows you and loves you completely, unconditionally. He also loves you enough not to leave you where He found you. Trust that He will bring you to completion, and that will happen without all your stridency. Learn this simple lesson of relaxing in the relationship, and you will find joy through grace.